This mod lets you buy perk points with dragon souls. There have been mods that let you get perks with dragon souls, but they have either been limited in functionality (forcing you to choose a specifc perk instead of giving you a perk point that you can spend on anything) or required Script Dragon (a utility which people need to let go of). I decided it was time to make a mod without either drawback. At the Guardian Stones, you will find a new stone, the Dragonstone. Using it will allow you exchange a number of dragon souls (user-configurable, default 10) for a perk point. If you'd like to change the price, simply open the console and type "set ishperkcost to X" sans quotes. Replace X with the number of souls you'd like the price to be. 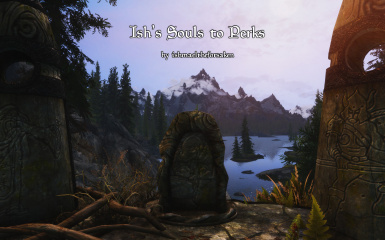 If you are running SkyUI 3.0+, you will find a section of your Mod Config Menu for Ish's Souls to Perks that will allow you to change the cost of a perk point without requiring you to use the console.